Yesterday Birgit and I were the "hares" in a Hash House Harriers run. You know, HHH is this drinking/walking/running/socializing club, with chapters almost everywhere in the world, particularly where you find english-speaking expats. The job of the hares is to lay a track, primarily using flour, which everybody else then can (barely) follow, while they run or walk. It could be done live, but that would be a bit tricky unless one knows the area really well. So we found that it took a surprising amount of preparation to scout out an area, and a trail that is interesting and that ends up where it started without repeating itself. So, we started with a nearby park, and managed to find a surprising number of somewhat hidden paths to lead people around on, along ditches, railways, climbing over some minor fences and that kind of thing. Worked out quite well, it seems. We got away with just a couple of "down-downs" in the obligatory after-run ritual. A down-down is the punishment of having to drink out a glass of beer while a certain silly song is being sung. And the hares will traditionally be under close scrutiny, and likely to be called on the spot for anything they might have done right or wrong (doesn't really matter which). Pop star George Michael is abandoning the music business to release his songs online for free instead. The multi-millionaire singer said he will never make another album for sale in record shops because he does not need the cash and does not enjoy fame. Fans will be given the option to make donations online in exchange for downloading the tracks, and the proceeds will be given to charity. He is promoting his latest album, Patience, which he said is his last. The 40-year-old star made his announcement during an interview with Jo Whiley on BBC Radio 1. Speaking about his decision, he said: "I'm sure it's unprecedented, it's definitely unprecedented for someone who still sells records. "I've been very well remunerated for my talents over the years so I really don't need the public's money." He added that he hoped people downloading his music would donate to his favourite charities. Explaining his decision, the former Wham! frontman said: "It does two things - it takes the pressure off to have a collection of songs every so many years, which is what nearly killed me. "I'm not pretending I won't be famous any more, but in the modern world if you take yourself out of the financial aspect of things, you're not making anybody any money, you're not losing anybody any money. Believe me, I'll be of very little interest to the press in a certain number of years. I'll hopefully be a happier man, giving my music and also doing something really positive with my music if people are generous enough to donate to the site. I'll remove myself from all that negativity." Bravo. Great idea. Now, if I only liked his music. But does that mean it will be open source and/or public domain? His site crashed Mozilla for me, so I didn't get around to finding out. Such an act of gift giving would work best, of course, if anybody, on their own initiative, could decide to make a compilation of his music and distribute it in whichever way they found appropriate. Good. Always helps with some diagrams. 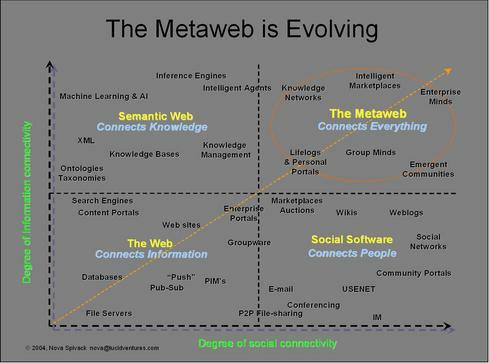 So, we want the MetaWeb, of course. Everything connected. Now we just need somebody to implement it.